Are Multi-Cultural Leaders the Future? Most of what I’ve read/heard about church leadership says we should fight tenaciously to maintain clear purpose, vision, and values within our organization. And recruiting other leaders who conform to these is vital. Allow too many people inside who hold divergent ideas and you’ll derail the organization. But this mindset assumes that efficiency is the ultimate value to which all others must surrender. But in many cultures efficiency is not the highest good. And third culture leaders understand that in many cases clinical efficiency simply is not possible when seeking to lead diverse populations. Read the rest of his post The Post-American Church (Part Uno). Do you think that the current church leadership structure will make this change, or will it take an emergence of new multi-cultural leaders? Do you disagree with these ideas entirely? 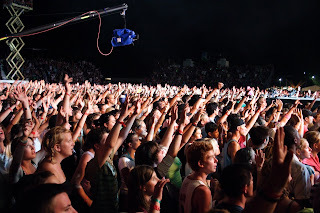 There is something very powerful for me about worshiping and singing in a large crowd of believers. 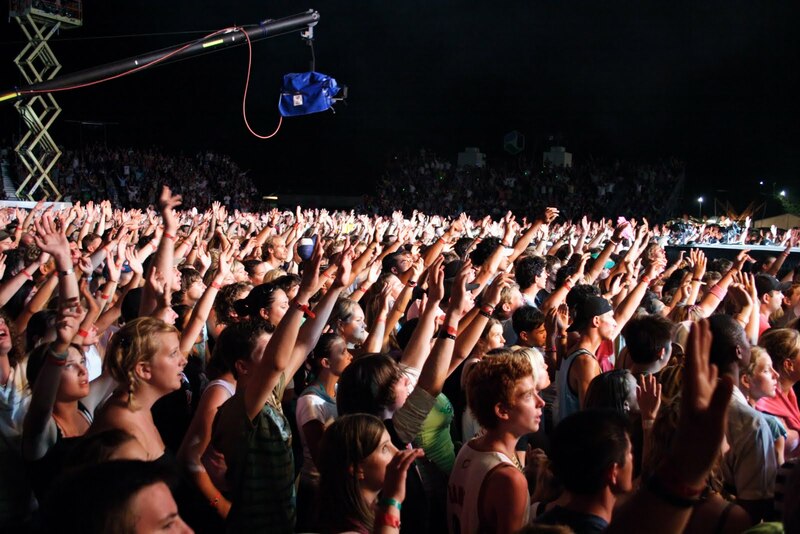 Hearing a cacophony of loud voices all praising God together transports me to imagining what heaven will someday be like, when we are all be praising God together, thousands upon thousands! This past Sunday, I began to mourn the loss of these experiences. Evangelical churches in Austria are small, typically 25 - 50 people. When we live there, it will be rare that we will have the opportunity to worship in a large crowd in our "heart language" of English like we get to do every week now at Parkview. As we were singing a song this Sunday that was especially powerful for me, I was moved to tears thinking about how much I will miss that worship experience. There are many exciting things about moving to Austria and the work we will be doing. But there will also be many sacrifices. This is one that I will miss very deeply. Why Do Americans Act Like That? Do you ever think about American culture and what makes us different from other cultures and countries around the world? I admit that even though I'm preparing to live in a foreign country, I don't always think critically about the assumptions and values that are a part of my life as a result of growing up in the U.S. I just came across a really interesting article that provides an overview of some distinctives of American culture. I think the author hit the nail on the head... Reading it definitely made me recognize the things that I will not be able to assume when I live in Austria. I can confidently say that I value everything on this list...sometimes to a fault. What aspects of American culture have most impacted your values? A few days ago, I went for a bike ride on the road. The weather was perfect, the sun was out, it wasn't too hot...everything was wonderful. I did a familiar 17-mile loop, and it felt a lot like home. In the winter, I miss the freedom, speed and head-clearing that riding outside provides. As I rounded a turn towards my favorite section of the ride, the road that goes right along the Cantigny golf course, I rode in behind another cyclist. He was older than me, and clearly in better shape than I was. He went at it hard, but I was able to keep up with him. I am not sure if I followed proper road etiquette, but I fell into his draft as we crossed beautiful prairie and rolling hills (which are hard to come by around here). Over those 3 miles, he tapped out a strong tempo. I had to push hard to stay with him. At the end of the road, he went one way and I went another. Drafting is a specific skill in cycling that is all about efficiency. One rider has to ride as close as they can to the other rider's back tire. The rear rider can save as much as 30% of their energy by riding in a draft. The front rider is able to set a pace that is faster than either could sustain by themselves. As I thought about those short 3 miles, I saw this as a great illustration of mentorship. When we do life in community with people that are further along down to road, we are able to glean wisdom and live in their "draft." They speak into our lives and can help us to ride at a spiritual pace that is above how we could live our life on our own. So here is the question: Who do you have that is helping you grow? Who are you drafting in your life? If you don't have those sorts of relationships around you, here is your chance. Grab a chapter of scripture, a person you are close to (or someone you would like to be close to) and a cup of coffee and spend 30 minutes reading, asking questions and challenging each other to be more like Christ. Spring Getaway in the Alps! By far one of the most crucial parts of our Vision Trip was connecting with our WorldVenture team. WorldVenture has 9 missionaries on the ground in Vienna, and we are excited to join them in ministry. At the start of our Vision Trip in April, after spending 1 day getting over jet lag (at least a little), we spent the next 5 days on the “Spring Getaway”, a WorldVenture team retreat in a mountain town in the Alps. We stayed at an affordable hostel that allowed us to use a large room for worship and study time, group meetings and sharing time. 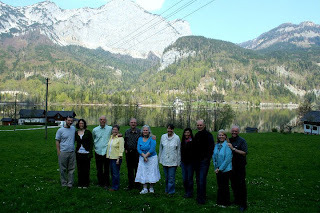 In addition to the Vienna missionaries, the WorldVenture teams from Germany and Slovenia joined us for the retreat. Conversations with our fellow missionaries over meals, hikes and down time allowed us to absorb so much about Austria, ministry and what to expect when we first arrive. Each missionary or couple was allowed 20 minutes of sharing time in front of the group to talk about their last year in ministry and what they have been learning. It was valuable to get a broad perspective of where and how God is using each missionary. We were given the chance to share our story with the group – how God led us to Austria and what we envision for ministry. We got to know all of the missionaries and began building relationships with people who we will be serving alongside for decades. When we move to Austria, we will see familiar faces! We were blessed by quiet times with the Lord where we could pray and process all that we were learning and absorbing. God really spoke to me (Bethany) there and used that time to give me an overwhelming sense of peace about the next year of our lives and the journey we are on. We got to worship the Lord together and we listened to sermons from the Willow Creek leadership conference, which led to some really encouraging and challenging discussions. We conducted video interviews with missionaries, asking them all about the spiritual needs in Western Europe and where they see God working. We are excited to share these with you over the coming months. We spent 3 hours in the car to and from the retreat with our team leaders, Celeste and Peter Persson. We talked the whole time both ways, all about their 28 years of service in Austria and what God has been teaching them. We asked questions and learned so much just in those conversations. We felt the retreat was the perfect way to begin our Vision Trip to Austria. It laid a solid foundation for the rest of our 2 weeks by connecting us with our team and with God, before the fast-paced experience in Vienna that followed. We were so thankful for this time! Vision Trip Wrap Up from nate johnson on Vimeo. We're home, safe and sound! We arrived back in Chicago Thursday night and since, have been reflecting on how valuable and educational our two week trip to Austria was. We learned and absorbed so much about the Austrian culture, church dynamics, our WorldVenture team, and ministry opportunities. The trip deepened our passion for serving in Austria and gave us many stories to share with friends and family here. We're so thankful for the opportunity we had to visit. Thanks to so many of you for helping to make the trip possible and praying for our time there! Our first 5 days in Austria were spent on a retreat with the WorldVenture teams from Germany, Austria and Slovenia. It was a great time of developing relationships, discussing ministry, and learning about missionary life. We met with the leadership of an Austrian evangelical church association called the BEG. We will likely be partnering with the BEG in church planting projects in the future. We visited the site of a future building and development project east of the city called aspern seeschtadt. By 2028, this area will house 20,000 people. When the first 5,000 move in 4 years from now, the BEG envisions planting a church and sharing the gospel in this new community. We hope to be a part of this project! Caro, a friend from church, took us climbing in Modling. We enjoyed getting to know her and hearing about her experiences in an evangelical church in Austria. Celebrating Christ's resurrection Easter Sunday morning. We learned a lot about the Catholic church in Austria and the challenges it is facing today. Many Austrians are cultural Catholics, but do not know Jesus Christ personally. We are passionate about giving more Austrians access to the gospel! Walking the grounds of Schonbrunn Palace with a WorldVenture teammate. Thank you, Greta, for taking photos of us! We helped set-up and participate in a Passover Seder service at the Evangeliumsgemeinde (our team leaders' church). We enjoyed meeting church members and reflecting on Christ as the passover lamb. Making new friends at church on Easter! For more photos, visit www.facebook.com/nateandbethany.